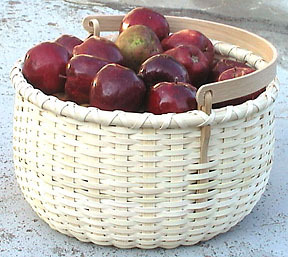 Apple Basket pattern uses spoke construction featuring a double bottom, continuous weave and a 12" Round White Oak Swing Handle with Ears. The basket measures 12 inches in diameter and 7 inches in height. Tools needed: Scissors or Shears, Pencil, Chip Carving Knife or Hand Plane, Clothespins (spring type), Container to hold water, Measuring Tape, Basketry Packing Tool or Bone Folder, Plastic Twist Ties or Cable Ties, Old Towel and Ruler or Basketry Leveling Tool. Calculate Supplies for 1 to 20 Apple Basket with Swing Handle baskets with the Basket Supply Calculator. The Supply List gives you the least expensive way to purchase the supplies for your quantity of baskets. View on-line or print to your printer.